Let’s face it, she’s not the brightest bulb in the room. Chris Wallace destroyed Wasserman Schultz yesterday on FOX News Sunday. The radical DNC Chair tried to persuade the host that Obama had no responsibility for his failed Solyndra venture. 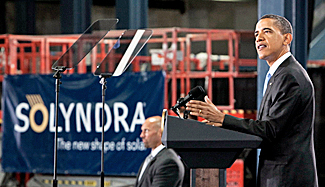 In August, Barack Obama’s gleaming example of green technology – Solyndra – filed for bankruptcy. The solar panel manufacturer squandered $535 million of stimulus money in a little over a year. But, Barack Obama had no regrets. In fact, Barack Obama was so impressed with the failed solar company that the administration wanted to give it another $469 million on top of the $535 million to make it an even billion dollars in taxpayer cash. But, Wasserman Schultz says Obama has no responsibility for the failed venture.